Forged steel 3 piece ball valve with mounting pad, floating type, side entry, full bore(FB) or reduced bore(RB), NPT or BSPT end. Metals Valve manufactures small sizes(2″ and below) forged steel floating type 3 piece ball valves covering pressure ratings of 800LB, 1500LB and 2500LB. These lever operated valves are often furnished with screwed ends. The bolted body is constructed by 3 separate body parts. 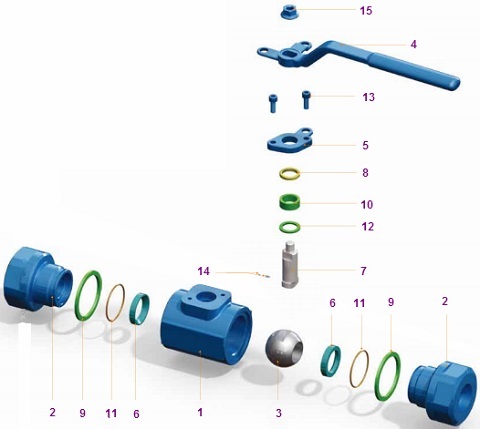 The central body can be easily removed without disturbing the end connections hence it is cost effective for maintenance. See the technical specifications for full port and reduced port forged steel three-piece ball valves. Design features of forged steel three piece ball valve, floating type, side entry with mounting pad. (1) The integral locking device which is used to secure the line flow. (2) Anti-static device (optional). (3) ISO 5211 mounting pad which simplifies the installation of actuators. (4) T shaped blow-out proof stem. (5) O-Ring seal to protect the threads from crevice corrosion. This floating type 3 pc ball valve is soft seated and can be manufactured from forged materials including carbon steel, alloy steel and stainless steel. 3D explosive view of forged steel 3 piece ball valve, floating type, NPT connection. 14 Anti Static Device S.S. S.S. S.S. S.S.
15 Nut Carbon Steel S.S. Carbon Steel S.S. The conventional material selection for 3 piece floating ball valves. Other materials are available upon request.